I rushed back to the hotel, and we checked out around 12:15 PM. The people there screwed us, but I really didn't care about that. The fact was, everyone wanted to leave after three days and two nights, and I wasn't going to be able to prolong our stay. For this reason, I decided to take an optimistic view, and savor the time I had there, and of course vow to come back again. The reason people in our group started to get on my nerves was simple. We often found ourselves walking around for longs periods, due to indecisiveness. I don't know, I was madder the past two days than I am now. I guess being sick has made me that more on edge regarding certain things. But, hopefully we are getting into the travel groove. I'm going to miss Eric when he leaves in a week, due to a lack of money. I on the other hand, was $10 under budget per day by the end of Prague. However, I've spent a lot of money since I've been sick, and in Venice. Luckily, we're on our way to some Northern Italian lake retreat where expenses will be much cheaper. From there we'll probably go to Florence, Rome, and Greece. I'm really enjoying Italy, especially the architecture. I'm the only one so far who hasn't spoken to my parents. I tried in Prague, but realized they were on vacation in North Carolina. I also remembered that they are going to take a week in August to visit friends and family in New York. We reached Como after a mad dash at the train station in Milan. As it turns out, we didn't even have to leave the train we were on originally. Since we didn't know this, we got off the train at Milan, went to the Information/ticket booth, waited in line, and then found out. This resulted in us running around the train station with our packs bouncing back and forth. When we got to Como, it was a twenty minute walk to our hostel. Once there, I found out that I was the only one with a Hostel Card, thereby getting the cheaper rate (15,000 lire instead of 21,000 lire, or $2). This hostel was my first experience with the “hole” style of toilet. My aim was true, and I managed not to make a mess. I took a photograph to document the insanity of these toilets. After walking around the town, and not finding much, we went back to the hostel. 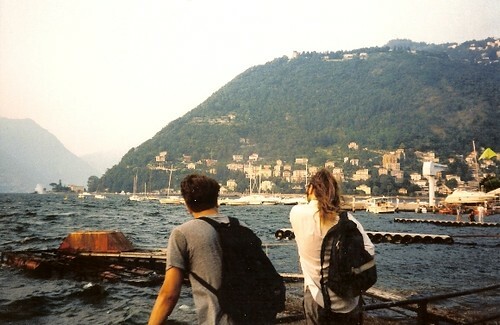 Actually, we walked around the lake (seeing no place to swim), and I admired the palazzos (palaces) that lined its shore. I think one of them even belonged to the late designer, Versace. Somehow, I managed to get really drunk that night. All I had was a small bottle of white wine I had bought in Venice, and two pints of Devil's Kiss beer. The beer tasted great and it was 7% alcohol. Also, this hostel had a nice backyard with grass, trees, tables, and benches. Most of our fellow travelers were European. This morning we had an ok breakfast, I was slightly hung over. It rained during the night, and I found the close I had left out to dry were soaked and dirty (the gutter practically emptied onto the clothesline). We left to find a more rural location around the lake (the thing turned out to be huge). We waited around for two hours for about two hours for the blue bus to Menaggio. When we finally got on the bus, it was a beautiful one hour drive to our stop. The scenery/architecture seemed Mediterranean. All the towns and buildings were pastel colors, with tile and slate roofs. The mountains surrounded the lake. Though I still think Venice is the most beautiful thing I've seen, this seemed to come in a close second. The road that wound around the perimeter of the lake was only two lanes, and weaved through very small towns. The bus would normally glide past wall a mere inch or two away. It was quite scary. We arrived in Menaggio, and immediately went to the hostel that was nearby. Unfortunately, it was booked for the night. We wandered past 4 star hotels and even a cinema and mini golf place, before finding a place to stay at a campground (Campaggio Europe). All except Bill waited till a bungalow was free (30 minutes), and then we moved in for the night at 75,000 lire for four people. Bill had decided earlier to go his own way (till 6:30 PM). Meanwhile, we went swimming in the lake, and hung out at our bungalow. I did some laundry since my socks and underwear had managed to stink up my whole backpack (including all my other clothes)! I don't think my washing them helped either. Though I can't abandon the socks, I might get rid of the underwear. 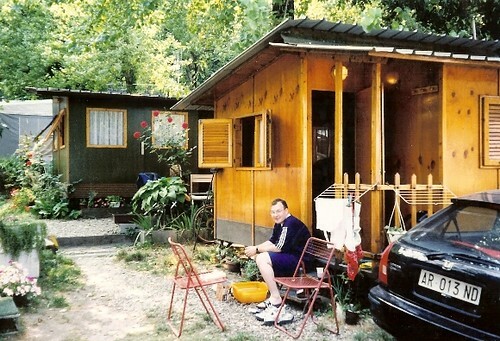 I really like this campground, lost of Italians taking their summer vacations. My sickness is starting to get better. We went to dinner, and I got a pizza with tuna fish on it. It smelled a little funny, but tasted fine. We came back to the bungalow and played some cards. Eric saw a mouse right before we went to sleep. We also took a dip in the lake after dinner, which was nice. The beach area is all rocks. Lets just hope that the lake would remain beautiful as years would pass by, just like the Angkor Wat in Cambodia.